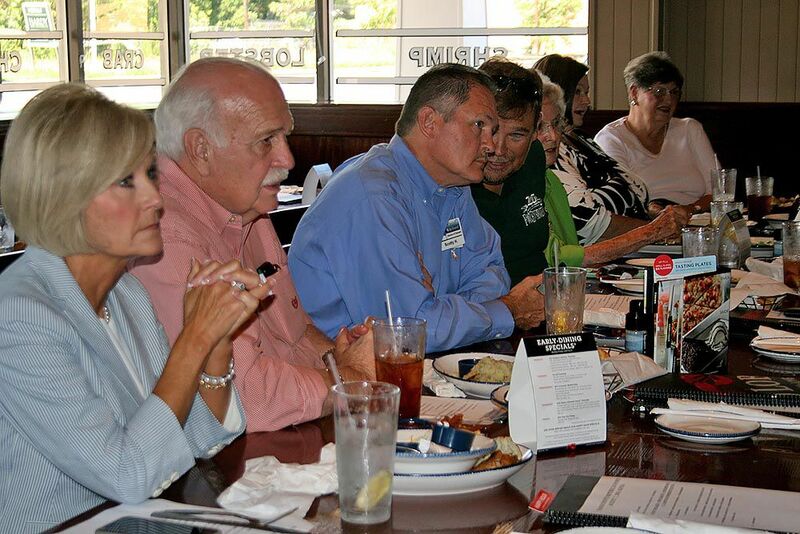 Their meeting was held at Red Lobster but the Floyd County Republican Women's group made it clear Tuesday that they wanted red meat. "What about the slush fund for women?" 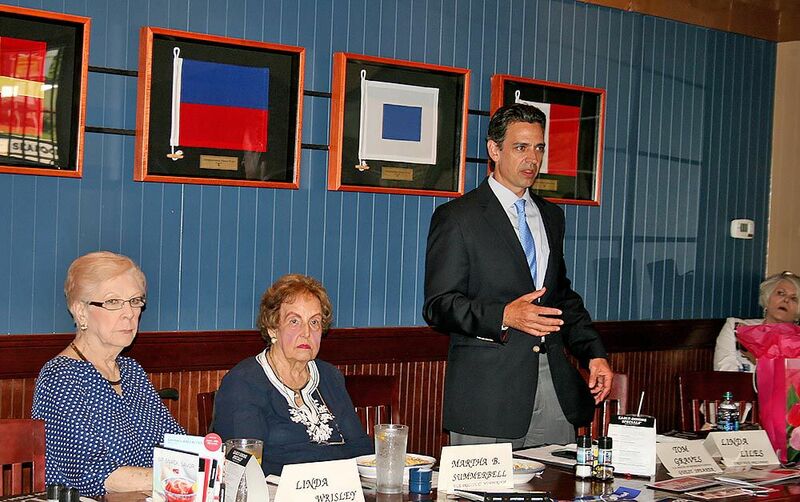 they asked U.S. Rep. Tom Graves, the featured speaker who drew more than two dozen men and women to the Shorter Avenue restaurant. Linda Wrisley explained to a bemused Graves that the question was about the fund used by Congress to pay sexual harassment claims. It's a line item in the legislative branch budget for employee settlements administered by the Office of Compliance. "Oh, that's done away with," the Ranger Republican said with a laugh. Graves spoke for about 20 minutes on GOP accomplishments under President Donald Trump, citing tax reform, a booming economy, low unemployment and new jobs. "You don't need higher taxes, more taxes," he told the receptive crowd. "We wanted more tax payers." There were nods and murmurs of agreement when Graves contended that Democrats — naming House Speaker Nancy Pelosi and Rep. Maxine Watters of California — want to roll back progress under Trump. And applause broke out when he noted that the individual mandate to purchase health insurance was repealed. "It was egregious, not just because of the cost. It also was a government mandate to purchase something you may not need and can't afford," he said. Many of the questions from the audience, however, drilled in on election-year issues and his commitment to Trump's agenda. Graves cited "a diversity of opinions and ideas" among the 237 Republican House members in answering queries on illegal immigration and children separated from parents at the Mexico border. It takes 218 votes to pass a bill, he added, but no Democrats would support any Republican proposals. "We have tried and tried to resolve this issue," he said. His "no" answer when asked if he is a member of the conservative House Freedom Caucus netted a few good-natured boos. But they quickly turned to cheers when he said his chairmanship of an Appropriations subcommittee made him ineligible but he holds similar views. "Get us a new Speaker of the House that likes Trump. Paul Ryan does not like Trump," Elaine Watson said as a follow-up. The direction elicited applause and scattered calls for Ohio Rep. Jim Jordan, a co-founder of the Freedom Caucus who recently announced his candidacy. "And we need a new attorney general too," one man said, in reference to Jeff Sessions — who's been criticized by Trump for recusing himself from the investigation into Russian election interference. "Yeah, get rid of Mr. Magoo," a woman added. Graves said he was vocal in April about putting in a new Speaker, after Ryan said he wouldn't run for re-election, but an early vote failed to gain traction. Asked later who he'd like to see in the position, Graves jokingly said "anyone but me" before praising the qualifications of House Majority Leader Kevin McCarthy. A number of attendees had other suggestions for the congressman, whose district covers 12 Northwest Georgia counties. Floyd County District Attorney Leigh Patterson's charge: Don't get too soft on criminal justice reform. "I get it that people are addicted to drugs ... (but) I'm tired of seeing repeat offenders hurting people to feed their habit," Patterson said. "I'm not into accountability courts for them, or putting them on probation." Graves — who's facing opposition in November from Dalton Democrat Steve Foster — also told the group to gear up for a costly and competitive election season. Georgia's races, he said, are even drawing interest from Democrats outside the state. "They're bringing the heat ... They're coming in from all over. They think there will be a Blue Wave, but we're ready," he said.